Appearance: Kallocain is tall and quite lean for a minotaur, however his well-defined muscles leave little doubt about his strength. He keeps his all-white fur short with no mane except for a small shock of bristly beard under his chin. Down-turned ears and up-turned horns draw on-lookers into his eyes which seem to be perpetually set with a fierce and intense gaze. They tend to glow white when he is invoking the powers of his god. Fharlanghn's symbol, the circle with a curved horizon, is emblazoned across nearly every piece of equipment Kallocain wears. Personality: Kallocain is as devout as they come, and everything he experiences is viewed through the lens of Fharlanghn's approval. This causes him to come off somewhat stiff, but despite the serious stare affixed to his face Kal can actually be quite jovial at times and enjoys travelling to new places he has never been before. Kallocain's first life was spent in Greyhawk. He lived a devout life as an acolyte to Faharlanghn, god of horizons and travel. As per his faith, Kal spent most of his years on the Eternal Pilgrimage and ended up seeing much of Oerth. In fact it is rumored he saw more than any mortal, living or dead. Why did you make this deal, and with whom did you think you made it? When as Kallocain grew old and infirm he looked back on his life and found his only regret was that he was unable to continue travelling. Unable to explore rumors of other worlds among the stars and other planes of existence. Hearing his anguish Fharlanghn's brother Celestian visited Kal on his deathbed and offered a deal: in exchange for another lifetime of service, he would be able to visit an untold number of worlds and planes as long as he continued to spread the word of the Dweller on the Horizon. The choice was not a hard one for Kal, he would get an entire new life to do his god's good work and Celestian would get to spread his brother's faith. He eagerly accepted. The next morning Kallocain's lifeless body was found by the side of the road next to one of Fharlangn's shrines, miles from where he lay dying the night before. The priests were unable to explain how this incredibly old minotaur was able to make it so far apparently unseen, nor could they explain the wide-mouthed grin plastered on his face. When Kal awakens he will find himself once again in his prime in the fresh-faced body of his youth. Where did you expect to be now? Kallocain knows not where he will awaken, only that it will be someplace he has never been before. Possibly somewhere none of Fharlanghn's disciples have been before. And that prospect excites Kal immensely. Current posting status: Checking RPGx multiple times every weekday for updates! Last edited by MoldyNolds; 01-16-2019 at 03:38 PM. Ready to roll. Let me know if anything is missing! Appearance: Standing at just below 3 feet tall, Lydia isn't the most imposing figure. Lock eyes, and one might reconsider. Her gaze belies a deeper cunning and finesse that most miss upon first inspection. Her long brown hair is drawn back behind a headband and she carries a backpack full of instruments and costumes, ready for any occasion. At her hip she carries a rapier, with one dagger hanging from her bag and another strapped to her leg. Basic Personality: Lydia is cunning and confident. She never relied on others in her time before coming to this place, and her voice, instruments, and sword-arm always served her well. She always knew when to break out her best ballad during a performance or which card games could see her mugged in the alley afterward. While valuing that independence, Lydia found that true beauty was forged in relationships with others, even if only for a blink of time. A look of sheer contentment from a drunken tavern-goer enjoying one of her songs or the rush of adrenaline fighting back-to-back with friends in a bar brawl. Those moments were worth the world.. so much that they led Lydia down a path from which she couldn't return. Lydia grew up in the land of Amn along the Sword Coast in Faerun. Her parents being halflings, they were in the minority of the population, but were sturdy folk that worked hard and earned their keep. Her father and mother were brewers whose ale sated the thirst of many a sailor on shore leave in Athkatla. Lydia had a deep musical talent from a young age, and spent her teen years playing to entertain in her parents' tavern. Lydia yearned to be the greatest musician in Faerun, and spent years performing to hone her skills. However, one is only so good as their fingers and vocal cords allow, and Lydia's talents fell short of the Amnian masters. Well into her 30's, Lydia wondered if magic or divine assistance might make the difference. She traveled the Sword Coast seeking knowledge, until one day, she came across someone who promised to help. A priest of Oghma, Lord of Knowledge, said they could help Lydia solve her problem if she would give a "lifetime of service" in the future. Thinking that meant serving the Oghma in the afterlife, she happily agreed. With that promise, Lydia stole a holy relic from a monastery and dashed it upon a summoning circle, fulfilling her part of the bargain. For this service, she received the gift of a silver tongue and the nimblest fingers. It turned out the priest of Oghma was indeed a servant of Loviatar (goddess of torture/pain). From that day on, Lydia could evoke the most primal emotions in those who listened to her performances. Unfortunately, this ruined hers and many others lives. Those enamored with her playing and singing followed her everywhere, hell-bent on hearing that which brought them peace and enlightenment. Folk that heard the deeper meaning in her saddest songs fell into deep depressions and lost their way in the world. Everything around her crumbled, and Lydia could no longer play. Lydia fled the populated world and withdrew into the interior of the continent. Years later, somewhere in the Chondalwood, her lonely song attracted a forester, who felt the deep sadness and depth in her music. Sitting together, they never left that spot and allowed the forest to close in around them. Lydia fully expected to end up in some sad limbo for seeking so much and being tricked. That or the hells. This was certainly a surprise..
Last edited by AmonBlackwood; 01-18-2019 at 09:33 PM. Just a quick question, Arachobia: What do you expect the posting rate to be? Appearance: Isa is in his awkward stage at the moment. Standing at 5' 8" with long gangly limbs and a twig like build. His longish brown locks stay neatly tucked behind his ears. His eyes are golden brown in color and rather large. His skin is fair with a light dusting of freckles across his nose and cheeks. Despite the rest of his body being twig like, his face still holds baby fat, only adding to his boyish appearance. He wears leather armor which has been dyed green with gold patterning making it look like it's covered in leaves. The long sleeve shirt and pants he wears under his armor are extremely light and comfortable made from a weaved mixture of green, brown, and gold threads. His last piece of clothing is a cobalt colored hooded cloak with a wooden clasp carved in the shape of a pixie. Basic Personality: Isa has almost no social skills to be heard of. He rarely speaks, having grown used to communicating entirely through the Message spell, and when he does speak his sentences are usually short. He's incredibly expressive and even without speaking it's usualy pretty easy to tell what he wants to communicate. Even without social skills he has an incredible way with people, his boyish charm and innocent aura tends to cause people to trust him easily. He's the type of person that people feel safe telling secrets to, because he won't share them with anybody. He has a bit of mishcevious side and likes to play harmless pranks on people which is his way of showing affection. He seems like the type that would scare easily but is actually quite fearless, to the point of recklessness. He can scare other people with his pranks, but others will find it hard to get him back by scaring him. Where are you from? Originally a normal boy from the material plane, at the age of six he was playing the forest one day and found himself a portral to the Feywilds. He ended up being unable to get back and spent the rest of his life among the Fey. A boy wasn't going to last long on his own somewhere so dangerous, but thankfully he was found by a Fey who took him in and raised him as his own. Isa was hidden from the other Fey for most of his youth as it would be dangerous to reveal the presence of an outsider. They communicated almost entirely through the use of magic rather than actually speaking for safety as well. For years Laise was his only contact, until finally he was old enough and strong enough to defend himself if need be. Why did you make this deal, and with whom did you think you made it? When Isa was fifteen, Laise was poisoned by a fellow Fey and was dying. Isa set out alone to get a cure to save his father figure's life. It was then that a figure appeared before him. Claiming to be a Fey god, Isa was told that the figure could save Laise in return for a lifetime of service. Isa didn't hesitate to take the deal. He owed Laise everything and now it was his turn to save Laise. The figure gave him a potion that supposedly cured the poison and Isa rushed back to save the Fey. Did you get what you wanted? The potion ended up saving Laise's life. Administered just in time, it was several days before Laise woke up and weeks before he was well again. But he was alive. Isa didn't regret the deal for a second and waited patiently each day for the figure to come back for his part of it. What was the aftermath? Something changed in Laise after surviving the poisoning. His become more wild, more aggressive and violent. Most days things were okay, but sometimes Isa had to stop him from doing something foolish. Laise went through phases of this aggression, seemingly unable to remember what happened during these fits. In between them he was perfectly normal. Only a year after making the deal, Laise had another one of his fits, this one worse than the others. Isa tried to stop him and ended up getting killed. Where did you expect to be now? Isa wasn't sure what to expect after he died. Though he was from the Material Plane, he had spent so long in the Feywild he was sure he would end up wherever they did. He had Fey blood in him after all. He had never learned much about the gods and didn't believe in any of them because of this. He didn't openly hate them either. He was just indifferent due to a lack of knowledge. Appearance Eileithyia is too short to be considered tall, but too tall to be considered short (5’4” for those who want numbers). She has platinum blonde hair and fair skin that she inherited from her father. The pointed ears and silvery-grey eyes came from her mother, or so she’s told. Eileithyia wears simple (but still colorful) clothes as a homage to her life as a miller's daughter. The one extravagance she allows herself is a gold necklace that has a pendent of the sun set with amber that was gifted to her by Lucan, her betrothed. Basic Personality Before Eileithyia made her deal, she was always optimistic about the future. Growing up in her tiny village meant that many people saw her fey ancestry and arcane abilities as marks of greatness, but it never went to her head. Instead, she saw it as a benchmark to strive for. She always pushed herself to her limits, whether it was working to learn a new spell or adventuring with the friends she met in Neverwinter and Waterdeep. Eileithyia was always very open about her thoughts and feelings, which had ended badly more than once, but she always chalked it up as more experience and moved forward. There was no point in wallowing in a past she couldn't change, right? After the deal, Eileithyia became more cynical. Over the years, Lucan had become the anchor that kept her grounded. Suddenly, without him there, she felt untethered. She obsessed over recovering Lucan's soul, and threw herself into the study of necromancy. She used her work ethic as a distraction from her sorrow. She suddenly understood how people got stuck in past. Eileithyia tried to keep appearances up so no one would look too closely at her work, but eventually word got out that she was practicing necromancy. She barely took notice as her friends and family began to shun her. If anything, it gave her more time to work on her magic. Where are you from? Eileithyia is from Faerun, specifically a little village called Oakhurst that sits to the northeast of Neverwinter. When she started to show a knack for magic, Eileithyia was sent to Neverwinter and, eventually, Waterdeep to master the art of spell casting. Why did you make this deal, and with whom did you think you made it? She was too drunk on alcohol and grief to remember much about the deal. She just wanted her fiance back, alive and well. She vaguely remembers telling a stranger she’d do anything to see him again and laughing when the stranger asked, “Would you even offer a lifetime of service?” A lifetime of service? Pal, I’d serve a thousand lifetimes to see Lucan again. Did you get what you wanted? Eileithyia got her wish but not how she wanted it. She woke up the next morning with a massive hangover and the undead corpse of Lucan in her kitchen. At first she was overjoyed, before she realized the truth of the matter. Her fiance’s body was present, but his soul was not. Eileithyia became obsessed with trying to resurrect her beloved, but her magic could never match the stories she heard of clerics bringing souls back to the material plane. What was the aftermath? She ended up shunned by everyone: friends, family, everyone. Necromancy was frowned upon in her town and she became an outcast. Some people would come to her when they needed help of the magical variety, but they were few and far between. Eileithyia lived in near solitude for almost a decade. One day, an adventuring party that wandered through town looking for spell scrolls were directed to her door. The over-zealous paladin walked in at an... unsavory moment and took it upon himself rid the world of her "evil". Where did you expect to be now? Honestly? Eileithyia thought the Nine Hells would be too good for her. She believes her journey into necromancy disgraced the memory of Lucan and that she deserves all the punishment in all the planes for what she did. -Lucan was a cleric of Lathander. They meet while she was studying in Neverwinter. -Eileithyia doesn't know much about her mother and she doesn't really care. For as long as she can remember, it has just been her and her father in Oakhurst. Her father never volunteered much information about her mother and Eileithyia never asked. -The rumor around town was that Eileithyia's mother was a very powerful high elf, a rumor that only grew in popularity when Eileithyia started to show a talent for magic. -She left to study at Neverwinter at fifteen. She began studying in Waterdeep at eighteen. -Before Eileithyia made the deal, she was on the path to becoming quite adept at transmutation magic. -She wasn't much for worshiping gods, but if pressed to choose she'd show liking for Lathander because of Lucan. -Her father died before she made the deal. -Before the deal, Eileithyia and Lucan had moved back to Oakhurst. Eileithyia was well respected and often times looked to for guidance among the villagers. -Lucan died of a sudden illness that acted quickly. From first symptoms to death was only about four days. -Eileithyia continued to wear bright colors after Lucan's death, mostly out of hope for his return. I haven't been checking in here as we've had a sick two-month-old in the house which has limited my online time. But I am still here and still planning to start at the beginning of Feb. I'm gonna just check if there's anything I need to update. From tomorrow I'll probably start prepping the game forum. Brigitte is as exotic looking as the Plane of Ravnica is. She is tall, standing 6’ and weighs about 130lbs. Her hair is dark as is her skin and her eyes have a strange red tinge to them. A black tattoo of what appears to be some kind of writing goes down the left side of her face, starting just under her eye and ending at the jaw line. 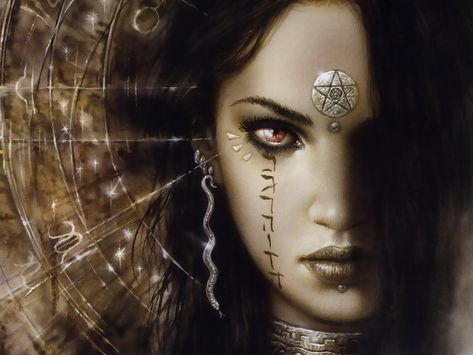 On her forehead is a metallic circle with spikes radiating out from it, having the appearance of an sun. She sports multiple skin piercings on her face, arms, legs and back. The jewelry she wears is made of some kind metal that has a dull shine to it and is carved with intricate designs and patterns. Her clothing always features the colors of Black and White, the colors of the The Orzhov Syndicate, one of the ten Guilds of Ravnica. Brigitte is quite social and asks a lot of questions. She wants to learn and experience as much as possible when ever she encounters a new people or culture. This includes partaking in toxins and other pleasures with out giving much thought about the consequence after words. After all life is short and should be lived to the fullest and without fear. Rachel was born and raised on The Plane of Ravnica. She led a good and carefree life there. Her family took good care of her and made sure she got everything she wanted. The Ogou family had made a long standing contract with the Orzhov Syndicate many generations ago. The terms of the contract where fairly simple, at least on the surface. The Ogou family would retain any and all wealth they gained. In exchange for this all first born from any Ogou family decedents would be turned over to the Syndicate for a life time of undeath servitude at the age of 30. The 30 age limit would allow any individual to fully develop any talents, if they had any. They are then executed by an Ender, and the life time of undeath servitude begins. The first born have no choice in the matter. Each first born is marked with an tattoo that goes from under the left eye and ends at the jaw line. If any first born showed any talent for magic or mental powers then a metal sun is placed on their forehead, the seal of the Orzhov Syndicate. These special individuals, such as the case with Rachel, would eventually hold high ranking positions with in the Syndicate, their talents to be used as the Syndicate saw fit. Rachel didn’t mind being an sacrifice. She was doing it for her family. And she was going to eventually become someone important. From her point of view it was a win, win situation. Everyone got what they wanted. It never once crossed her mind that perhaps not everyone wanted this forced on them. All she knew and was taught was that fore filling the contract was first and foremost along with the continued success of the Ogou family and those who would come after her. For filling part of the Ogou-Orzhov contract, Rachel got everything she wanted, as did her family. She believed it was worth it. Even though she knew she was eventually to be sacrificed, Rachel knew that death wasn’t the end, but just the beginning. Her family’s wealth and prosperity would continue for another generation, and she would have a new (un)life as an very important Guild member. Rachel doesn’t know what the aftermath of her death has caused. If anything at all even changed. Unlike her predecessors, who were eventually executed by an Ender when they turned 30 and then became an undeath aid to the The Orzhov Syndicate, her body disappeared. Perhaps there was something in the fine print of the contract that the Ogou family didn’t know about? Last edited by voodoozombie; 01-31-2019 at 09:04 PM. Appearance: Zara is a lovely young lady who looks as though she's seen a lot. Yet, there seems a sense of relief about her as well. She wears elaborate clothing covering light leather armor. 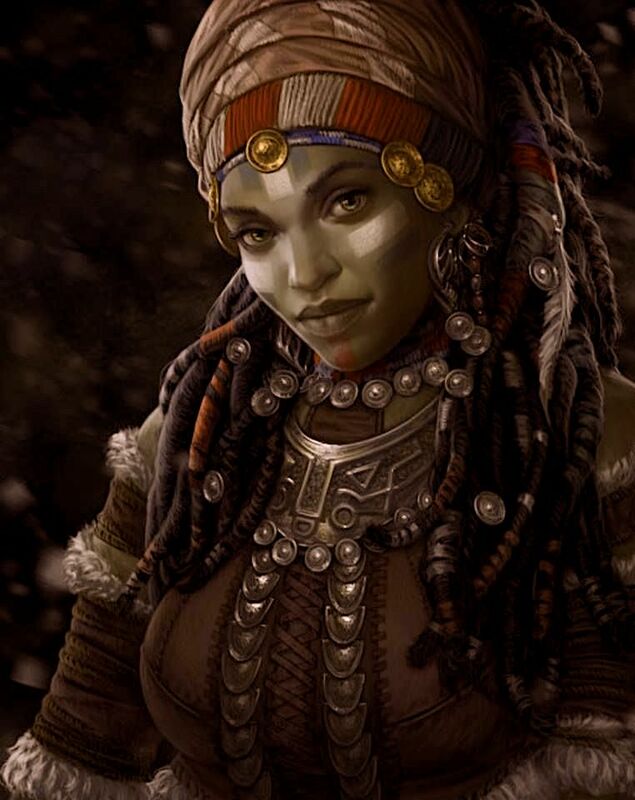 She has dark mahogany skin and if you can see her ears under her dreadlocks and hair wraps, there is definitely a hint of elf in her. Basic Personality: She's fairly outgoing when she wants to be, but often has her nose in a book. In her former life, this was more pronounced, now she seems to be more interested in her surroundings and learning from others. Where are you from? Svengaard, a mid-size port city in a unremarklable Prime Plane called Kethini. Why did you make this deal, and with whom did you think you made it? Zara's family was not particularly well off. 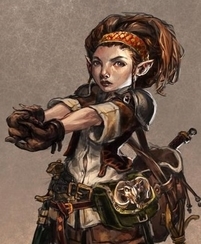 When Zara was old enough, she was hired by an old gnomish wizard to help out in his library. Zara soon discovered that she loved to read. And read, and read. She was a sponge for interesting information, mostly gathered from the gnome's esoteric collection of books. While she was a very bright young lady, she just didn't have the spark for magic, else she'd have become his apprentice. She was very disappointed because she loved magic and watching her master perform it. One day she "borrowed" some of his forbidden literature, ("Hey, it was whispering to me. I couldn't just ignore it!") and that's how she obtained a patron from gods-knows-where and became a warlock. Old Fintlethwip was not very happy with her, but did his best to guide her in the use of magic even though her path was very different than a wizard. She became quite a successful adventurer with her powers, although the Great Old One (Zara never knew it's name, suspected it was completely unpronounceable) often perverted her desires to do good things in the world. Her thirst for more knowledge and communion with the strange beings from beyond the stars was slowly driving her insane and she knew it. Realizing her boon was also a terrible curse, she sought to end the pact, but her patron was having none of it. So she sought out another potential patron in hopes they could break it. After many travels to exotic places, she came to the court of Titania, who listened to her plea, but informed Zara that the price would be heavy: A lifetime of service. She agreed instantly. A great ritual began, and ended with a green dagger piercing her heart. Her pact was broken at last. The bizarre mysteries of the universe she was privy to were forgotten. Did you get what you wanted? Absolutely. She certainly didn't expect the lifetime of service to be a completely new life, but her mind left crisp and clear. She wept tears of joy. What was the aftermath? Death, and awakening in this strange place. But a clean slate. But... no magic. She thought perhaps Titania would be her new patron. Note to DM: Not sure where I want to go here. She could try to seek out Titania again and ask for patronage, or maybe Titania granted her regular wizard abilities. Or I could just go ahead and say Titania is her patron. Where did you expect to be now? While she tried her best to do good in the world despite her patron's often incomprehensible plans, there were... mistakes. Needless deaths, strange horrors loosed on the world, other weirdness. She really didn't give her afterlife much thought. It's possible she's read about Sigil, but certainly didn't think she'd end up here. Back again after a long hiatus! Last edited by Fuzzbucket; 01-31-2019 at 09:28 AM. Applications are looking pretty interesting at a glance. Congrats to everyone who made it! See y'all there! Better luck next time to anyone who didn't. Wow, thanks! I'll have it up this evening!